The ongoing Indian General Elections are the largest elections happening in the history of mankind. Yes, never before have any elections been held on such a large scale. 814 million voters will choose their next Prime Minister. It is a marquee event, and media across the globe are talking about it. The video give below shows how Americans are looking at this Indian election (albeit in humorous way). British Comedian, John Oliver who now has his own new weekly talk show called “Last Week Tonight With John Oliver,”, which is aired on HBO every Sunday night at 11. 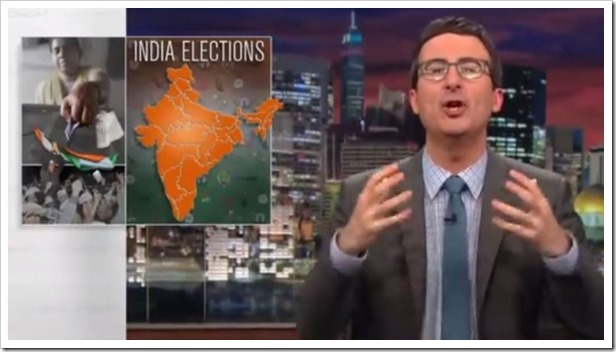 This really hilarious 8 minute video has Mr. John Oliver ranting about how this elections are completely ignored by American media and gives a reference to a elderly gentleman saying “What does Indian elections have to do with United States, it should not concern us even a bit, as they are not even in our hemisphere”! He then goes on to rant about elections being held between 2 main prime ministerial candidates Rahul Gandhi and Narendra Modi. He calls Rahul “The Indian Han Solo” and goes on to say that he is widely expected to loose to Narendra Modi. Then he goes on to rant about Narendra Modi and brings up the infamous 2002 Gujarat incident. There is a lot more, but I will leave you with the video; have a look and enjoy it! Here it is….